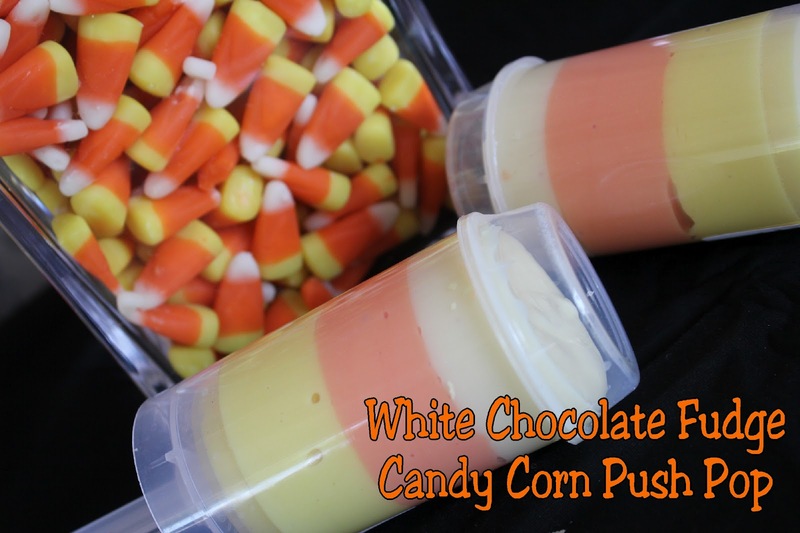 I have to admit how TOTALLY in love I am with these Candy Corn Push Pops that I made today. What makes them even better is that they have Fudge inside. And not just any fudge, but White Chocolate Fudge! Can it get any better than that? They were a little tricky to make. Not hard, just tricky. But you'll thank me for it later! I used 6 cups of white chocolate wafers. You can use white chocolate chips from the store too. I just love the taste of these so I use them in almost all of my candy playing. Place the chocolate in a microwave safe bowl. Make sure you have alot of room. I wish I had used a bigger bowl because it made it a little difficult to stir later on. Microwave on 50% power for 2 minutes. Stir the chips. Repeat until the wafers are melted. Be careful! White chocolate burns very easy and you will not forgive me if you burn that much chocolate since the smell is HORRID! While your chocolate is melting, place your push pop containers somewhere that you will be able to pour into them without too much trouble. I used the old printer box that I cut holes in for my Soccer Party last spring. Once your chocolate is melted, pour 2 cans of Sweetened Condensed milk into the chocolate. It will get really hard to stir as you get the second can in. You can pop the mixture back into the microwave for 1 minute on 50 percent power to help. Your mixture will be pretty stiff when you have it all mixed. Pour a third of your mixture into a seperate bowl. Tint the other 2/3 a soft yellow. Mine took a bit of color, but it could be that I was using the drops. Not the best for chocolate (gel is better) but it's what I had on hand. Here's where it gets a little tricky...Take your spoon and scoop out a little bit of the yellow chocolate. I found it was easiest to wrap the chocolate around the spoon. Then dribble it down into the push pop. You want it to be about 1/3 full of the yellow. Don't stress too much if it doesn't look flat or gets on the side. It will flatten out as it hardens. I then took a napkin and wiped the sides clean for the next layer. While that layer is hardening, take your yellow chocolate and add a bit of red coloring to it until you get a nice orange color. You will most likely need to rewarm the chocolate to get it pliable enough to play with. Fill your push pop 2/3 full with orange. Clean any side drips that you need to. Then take the white chocolate that you put aside and rewarm it. Add it to the top of the push pop container. It will be pretty forgiving, but try not to overfill. Now try not to eat the whole batch.